I haven’t had much time to write like I normally do, …so I’ll share my thoughts and show you the things that run through my mind as I’ve read this week..…. 2- OIL- just thinking about oil again, did you notice that oil comes from 2 different places 1) the brance (Jesus) and 2) the rock (Jesus again!!) isn’t that cool? 3- Condensation- okay- how did they know about condensation? Job 36:27 and David knew the earth was round – so what happened to knowledge that it disappeared and suddenly we find it again and think we are so advanced. Duh. 5- Job, Joseph, David, Moses, and Jesus have a lot in common. All suffered greatly before they were placed in power and blessings. Job was accused of wickedness (34:36-37) David was accused of being prideful (by his brother) Moses was rejected and accused (but God put them in their place) Joseph lived his entire childhood being hated by his brothers, and then Jesus- were all these lives symbolic of the Savior to come? 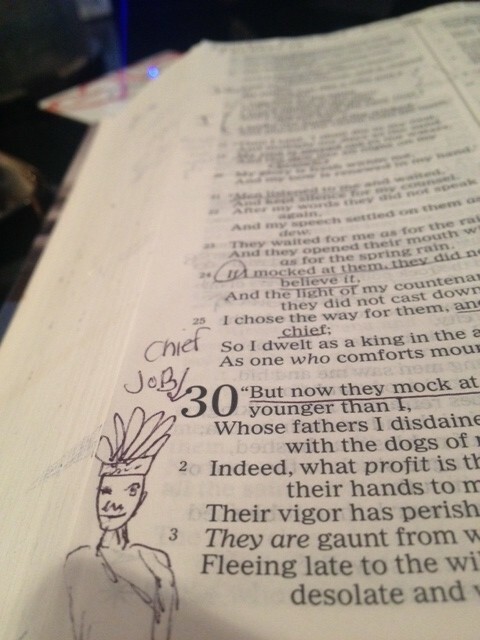 7- Job had to forgive his three friends, but the 4th– Elihu– he didn’t? Elihu was the only one not reprimanded for his words to Job. He was the youngest and he waited for the 3 friends of Job to speak first. I’m sure the entire situation scared him enough to learn the lesson, but still…something to think about. Elihu was a descendant from Nahor, Abraham’s brother, and I guess Sarah too if you think about it. 8- Elihu was a know it all, he was starting to get on my nerves too. Poor Job. 12- Don’t dis the preachers. In 1 Corinthians 3 it talks about how the word of God is planted in our hearts; one person plants the seed, one waters it and God makes it grow. Now there are some preacher/teachers that many people are against- with cause I’m sure, however I see that some of them prepare the soil- think about it. 13- I keep running into the story of Jonah everywhere I turn, but I know I’m not qualified to go to Nineveh, so I’m okay with that. Also, I keep running into place of rest- so that may be my next long post if I can sit for more that 5 minutes without being interrupted. 14- Walk properly!! Walk properly, Put on the Lord Jesus Christ, Make no provision for the flesh to fulfill the lust, Pursue things that bring peace- I have a lot to work on! Romans 13:8-14:19 What do you need to work on? Are you walking properly? 15- 1 Corinthians 3- Works in the fire – how exactly is this going to happen? I was watching Jungle Gold the other day and they took beautiful gold and had to put it through the fire to get out all the impurities. It reminded me that we may look and act all righteous but we each have impurities– Jesus has washed our sins away- yet we still must check ourselves, our heart and repent as soon as we see our sins. ← Brother Phil Robertson’s Personal Testimony… It Is A Blessing To Hear! 10- What exactly is the shadow of death? When I stopped to really ponder that it scared me! Like the black eyed….. I can’t even go there, but really, what is it? A a shadow? What? Such humor at Job’s expense. And what a challenge to write at your house. I nominate you for the first annual blogger determination award. Go Lisa.